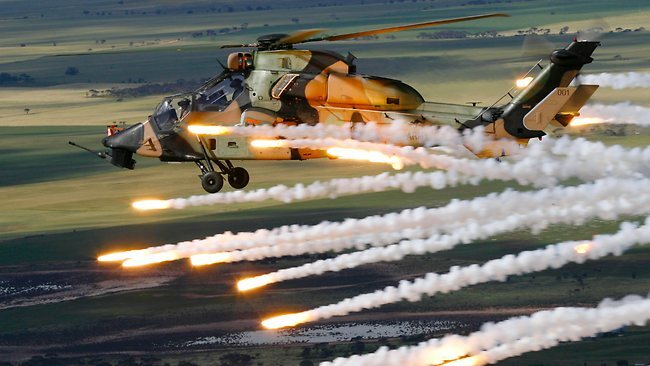 Helicopters play important roles in air-to-ground fire covering and short-distance air-to-air fights, as well as battlefield force transferring and anti-tank missions. Due to their low-attitude and relatively low-speed fight profiles, helicopters are subjected to serious threats from radio, infrared (IR), visual, and aural detection and tracking. Among these threats, infrared detection and tracking are regarded as more crucial for the survivability of helicopters. Firstly, passive detection and tracking by infrared signature seeking missiles are tactically superior to active ones for a comparable detection range. Infrared seekers have exploited techniques to passively acquire and intercept airborne targets by detecting their infrared emitting energy. Developments in infrared detection and tracking have increased the effectiveness of infrared-guided missiles, which are now portable and have proliferated world-wide. The rapid advances in processor and detector array technology have led to enhanced sensitivity, low noise, multi-spectral, and smart detection capabilities. On the other hand, with the increase of the ratio of power to weight for turbo-shaft engines mainly equipped in helicopters, the exhaust temperature increases tremendously, resulting in an infrared signature augment intensively. Consequently, infrared signature suppression is an important issue associated with helicopter susceptibility. In order to meet the requirements of infrared stealth, several different types of infrared suppressor (IRS) for helicopters have been developed. In the future, the comprehensive infrared suppression in the 3–5 μm and 8–14 μm bands will doubtfully become the emphasis of helicopter stealth. Moreover, a multidisciplinary optimization of a complete infrared suppression system deserves further investigation. (c) Airframe skin heated by the engine and plume. Besides, the reflected sky shine, earth shine, and sun shine contribute to the total infrared signature. The attenuation of infrared radiation in the atmosphere is highly dependent on wavelength of radiation, temperature, and composition of radiation participating gases. Mainly two atmospheric windows (3–5 μm and 8–14 μm) are used for surveillance and tracking where the transmittance is high. Tailpipe is the major and reliable source for infrared signature level in the 3–5 μm band because of the large amount of heat produced by combustion inside the gas turbine engine. The helicopter rear fuselage skin is always heated by the flow of hot combustion products in the embedded engine. Though the spectral radiance of the rear fuselage is less than that of the tailpipe, infrared emission from the rear fuselage is important especially in the 8–14 μm band. Meanwhile, the solid angle subtended by the rear fuselage skin is an order of magnitude larger than that of the tailpipe. Unlike surfaces of solids, gases emit and absorb radiation only at discrete wavelengths associated with specific rotational and vibrational frequencies. These frequencies depend on the particular type of molecules, temperature, pressure, and molecular concentration of radiation participating species. In general, the infrared signature level from the plume is much less significant than those from the tailpipe and the rear fuselage skin, especially in the 8–14 μm band. All major military research establishments have developed their own models for prediction of infrared signature level (IRSL) from aircraft. A lot of investigations on predicting infrared signatures for various infrared targets have been made, e.g., exhaust plume, exhaust nozzle , aircraft etc. It is known that the temperature distributions on the fuselage skin and in the exhaust plume have a direct impact on infrared signatures of helicopters. 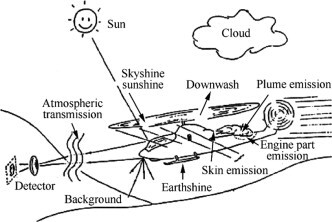 Because the temperature distribution on the fuselage skin is governed by heat transfer between the skin and inner hot elements as well as the skin and outer surrounding, there are many factors affecting the temperature distribution, such as rotor downwash, heat radiation from engine casting, convective heat transfer between the skin and cold air, solar irradiance on the skin, etc. On the other hand, the exhaust plume temperature distribution is seriously affected by the rotor downwash flow, owing to the mixing action. In order to understand how downwash impacts plume temperature and ejecting capacity of helicopter exhaust systems, conducted experimental investigations respectively. In these experiments, the downwash flow was simulated by a low-speed blower and downwash was evenly distributed. While in the modeling of temperature distribution on the helicopter skin, the downwash impact and solar irradiance were not taken into consideration. Recently, to precisely simulate temperature distributions on the helicopter airframe and in the exhaust plume, the effects of rotor downwash were considered in three-dimensional flow and heat transfer calculation under helicopter hovering. A rotor downwash model was presented to define the external boundary of rotor downwash. The above figure shows the effect of rotor downwash on the exhaust plume. The exhaust plume takes on strong downwards deflection to the rear fuselage, as well as deflection to the rotor’s rotational direction, under the action of rotor downwash. These deflections are especially obvious under higher rotor downwash. When the exhaust is ejected upward, the exhaust plume could come into collision with the rear fuselage, and pumping capacity of the exhaust system is weakened a little. While the exhaust is ejected in oblique or lateral directions, the exhaust plumes do not come into collision with the rear fuselage, and pumping capacities of the exhaust system are somewhat enhanced. Helicopter infrared suppression technology meets very advanced requirements today, but it is also true that it has reached a plateau, for the most part, with further increases in suppressing efficiency, coming as incremental improvements rather than revolutionary changes. In the interim period, advancements in helicopter infrared signature suppression technology have primarily been in more detailed understanding of infrared sources and higher sophistication of analytical tools. Jingzhou Zhang , Chengxiong Pan and Yong Shan are the researchers on aeronautical engineering aspect of helicopters and their research as part of Open Access is funded by Beihang University, Beijing, China and was supported by National Level Project and Provincial Level Project. The research paper is published under Creative Commons 4.0 license.